With the election looming, a lot of my friends have decided to cast a “donkey vote”. Some because they’re irritated with politics, others because they don’t understand or they just don’t care. At the turn of the Nineteenth Century, women were desperate for the vote. They wanted governmental representation and an active opinion on the laws which would affect them. Thus, the first wave of feminism began. These women were known as the Suffragettes. Perhaps you’re familiar with them from a childhood of watching Mary Poppins or your unhealthy addiction to Downton Abbey. The Suffragettes were the women who marched in protests, signed petitions and wrote strongly-worded newspaper articles. They fought for our right to vote. Fiercely. Although laws were followed by both men and women, they were created by men. Without a Parliamentary representative, women were not entitled to an opinion on laws about divorce, child custody or property ownership, amongst others things. The vote allowed women to be on a more equal footing with men socially. ‘Thirty-three thousand signatures to the Suffrage Petition were obtained in less than six months. It was the largest petition that had ever been presented to Parliament on any question and tremendous interest was aroused when the bulky document was carried by several attendants into the legislative chamber’. While the main priority of the Suffragettes was to obtain the vote, they also advocated for issues surrounding women such as accessible information on birth control and the implementation of women into governmental roles. One of Australia’s leading women, Louisa Lawson, began the first women’s newspaper The Dawn. ‘A woman’s opinions are useless to her, she may suffer unjustly, she may be wronged, but she has no power to weightily petition against man’s laws, no representatives to urge her views, her only method to produce, release, redress or change is to ceaselessly agitate’. Australian women were granted the vote in 1902, although the first female politician wasn’t elected to Australian Parliament until 1921. Her name was Edith Cowan. She was an activist for women’s and children’s rights and was heavily involved with women’s suffrage. While the suffrage cause in Australia took the form of protests and petitions, the movement began to have severe consequences in the United Kingdom. The Suffragettes used militant tactics to get the attention of the public and the government. They chained themselves to railings, smashed windows and set mailboxes on fire. Many women were arrested jailed as political prisoners. The film Iron Jawed Angels is based on activist Alice Paul’s life as a Suffragette. It shows the more gruelling side of the Suffrage movement where women were thrown in jail. Many of them participated in hunger strikes in protest of their abhorrent treatment in prison, only to be strapped down and force-fed. 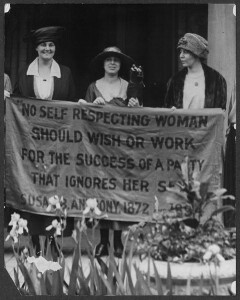 The suffrage cause lasted more than fifty years. The Suffragettes were ridiculed by men and women alike who strongly believed that a woman belongs in the home. They fought against people who loudly proclaimed that women didn’t have the capacity to make decisions that would affect the government. And after all of this hard work to give women a voice, it would be a shame to not use it. This entry was posted in Featured, Feminism, Politics and tagged feminism, feminism 101, politics, suffrage. Bookmark the permalink.